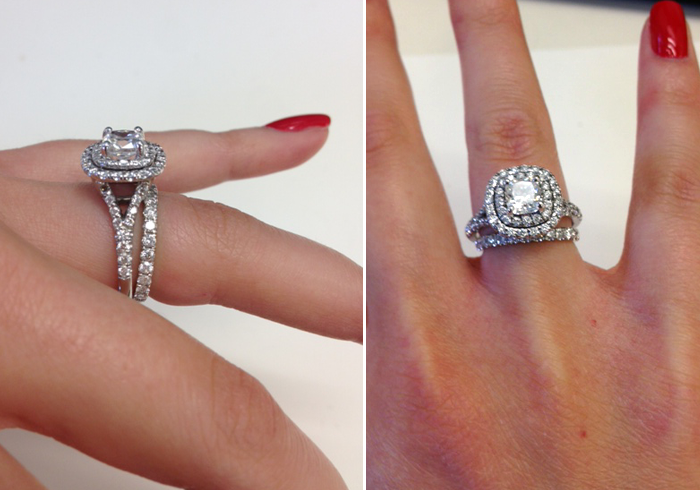 When purchasing an engagement ring, most people don’t consider the wedding band that will eventually go with it. This is probably because most engagements are a surprise and so there is no conversation about a wedding band. Purchasing an engagement ring also is very expensive, so many put off thinking about their wedding bands until closer to the actual wedding date, which can be up to a year or so later. Although this is rational thinking, sometimes, having an idea of how your fiancé would like to eventually wear her diamond rings can be extremely helpful in selecting what style of engagement ring to choose initially. Style number HE232 with a matching wedding band that sits flush. Most engagement rings are designed as either flush set or with some sort of basket design. Flush set mountings are ring settings where the diamond is suspended in such a way that a standard band can sit right next to it. An engagement ring like a solitaire or one that features a cathedral design will often be able to accommodate a flush set eternity ring or wedding band. An eternity ring features diamonds or gemstones all the way around whereas a wedding band will either be solid metal or only have stones on a portion of the ring. Flush designed engagement rings are more traditional in style. Style number HE140 and a gap between the diamond eternity wedding band. Engagement rings with a basket design are rings that feature a structure which extends underneath the center stone and extends outward from the shank of the ring. These types of engagement of rings typically are more ornate as they give more opportunity for diamond accenting, hand engraving and overall design flourishes. Basket designed engagement rings typically require a custom curved wedding band in order for it to sit 100% flush with the ring. Some people do however prefer to leave a gap because they intend to stack other bands in the future or they simply choose to wear the wedding band on the right hand. Basket designed engagement rings are becoming more popular among jewelry designers who constantly push towards more unique and stylized engagement rings. 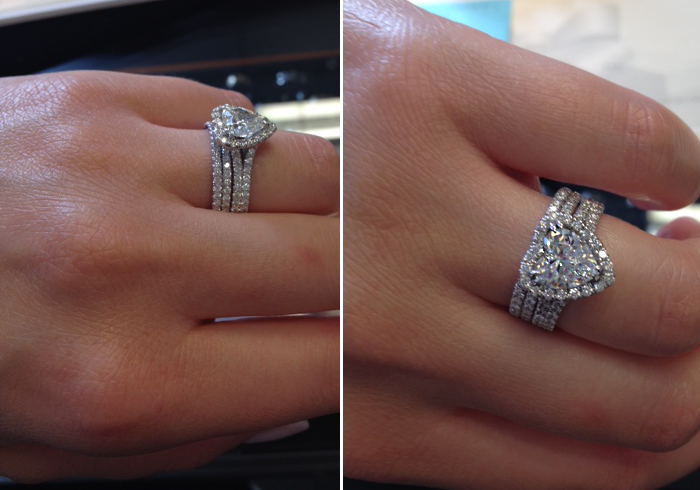 As a bridal manufacturing company, deBebians offers both flush set and basket set engagement ring styles. All of our mountings are customizable so we can always convert an engagement to sit flush or be embellished with a basket if you don’t see exactly what you are looking for. We can also custom make any style of wedding band so that you can always have a perfect set, regardless of what style engagement ring you choose. If you are not sure about how a particular ring will look next to a wedding band, you can always ask for recommendations from any of our staff.